I’m not the bigger fan of peaches, and it might be a little too much for multiple beers, but I can’t taste anything else. After half, I think I shan’t buy this again. My wife seems to like it, but she’s a peach lover. 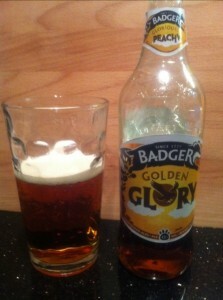 This entry was posted in beers and tagged badger. Bookmark the permalink.